It was the 19-year-old’s first competitive goal for the Londoners. First competitive goal: Leanne Kiernan. LIFE IN LONDON has started on a high for Ireland teen sensation Leanne Kiernan as her star continues to rise across the water. The highly-rated 19-year-old striker made the move to West Ham from Shelbourne this summer and has well and truly gotten off the mark in the Women’s Super League (WSL). 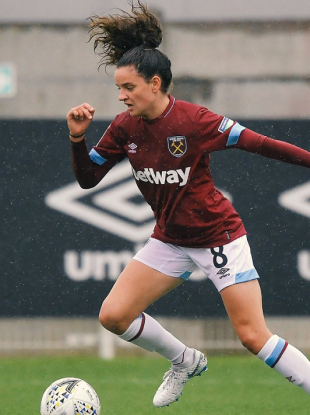 The Cavan star rattled the back of the net with a stunning curled effort as the Hammers beat Lewes 4-1 in their Continental Tyres Cup clash on Sunday. In doing so, Kiernan grabbed her first competitive goal for her new club in their first home match of the 2018/19 season. She previously fired home in their 1-1 pre-season draw against London Bees last month. Kiernan made her competitive debut for West Ham against Arsenal in the Cup last week and contributed an assist but her Ireland teammate Katie McCabe was on the double for the opposition, helping them to a 3-1 win. We're 2-1 as @kiernan_leanne unleashes a stunning curler, which finds the net via the crossbar. Email “Irish teen prodigy Kiernan scores sublime goal as bright start at West Ham continues”. Feedback on “Irish teen prodigy Kiernan scores sublime goal as bright start at West Ham continues”.